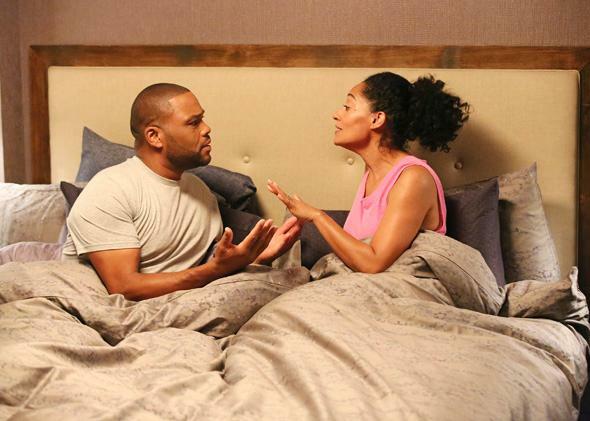 Black-ish review: ABC TV show about black family is the best new sitcom of the fall. Black-ish is proud, politically incorrect, and the fall’s best new sitcom. Anthony Anderson and Tracee Ellis Ross in Black-ish. Dre may feel like a bit of an oddity in his own life, but he is, outrageously, even more of an oddity on television. Since The Cosby Show went off the air more than two decades ago, the black family sitcom, give or take a Family Matters and an Everybody Hates Chris, has been all but extinct on the major networks. The Cosby Show hovers around Black-ish, in spirit and a few of its details—including Black-ish’s print ads, which recall one of The Cosby Show’s opening credit sequences—but The Cosby Show rarely addressed race openly, even as it was suffused with a strong sense of racial pride. Thirty years after that earlier show debuted, Black-ish, just as proud, talks about race nonstop. Funny, substantive, and original, it’s the best new sitcom of the fall. Happily married to Rainbow, a biracial doctor (Tracee Ellis Ross, the best), and living with his four adorable children and curmudgeonly father, Pops (Laurence Fishburne), Dre is expecting a promotion at work that will make him the first black senior vice president at his advertising firm. But he soon learns that he has been made senior vice president of the new Urban Division, a title that flummoxes him. “Wait, did they put me in charge of black stuff?” he wonders. Dre is furious and hurt that his company would recognize him more for being black than simply being good at his job, and yet at the same time his promotion exacerbates his anxieties about his family’s racial identity. His oldest son, Andre (Marcus Scribner), a freshman in high school, wants to go by “Andy,” play field hockey, and have a bar mitzvah. His youngest kids don’t seem to know that Barack Obama is the first black president and refuse to describe people using racial signifiers. Dre chafes at being racially pigeonholed at work but also frets that the people he loves most are missing some essential blackness at home. “I need my family to be black, not black-ish,” he yells at an emergency family gathering. Despite Dre’s freak out, Black-ish does not argue that there are specific behaviors that make someone “truly” black. (One of the more interesting wrinkles in Black-ish is the way class issues play out within Dre’s own family. He grew up in the “hood,” but apparently Rainbow, with her hippie-dippie-ish name—can’t wait to meet the in-laws!—did not, and their kids, of course, are getting a prep-school upbringing.) Over the course of the episode, Dre is successfully convinced by his family—his wife, his children, and even his father—that he is overemphasizing certain signifiers of blackness, that he and his family are irrevocably black, no matter how much money they have or how many bar mitzvahs they ask for. And yet, still, Black-ish is sympathetic to Dre, even as he is tweaking out to the point of dressing in a dashiki and throwing chicken bones at his son. Dre’s fear that he has somehow failed to pass a powerful, important sense of identity on to his children may be frenzied and out of all proportion, but the show respects his misguided concern: what a terrible thing that would be to lose. Dre, in the storied tradition of sitcom dads, is often something of a clown, but he’s no fool. Black-ish is not politically correct. But its lack of political correctness is not meant, particularly, as a provocation. Political correctness is simply not sufficient to explain the nuances and complications of Dre’s life. In the punchy opening monologue, Dre worries about whether, in “an effort to make it, black folks have dropped a little of their culture” and ceded it to others. “Not that I want to go back to being the big scary black guy, but it did have its advantages,” he says, as a white woman fearlessly flicks him off after stealing his parking space. This is a great, queasy punch line. With Trayvon Martin and Michael Brown on our minds, it might strike some people as in poor taste. But it’s the quintessential example of this show’s willingness to be funny about the very real complications of being black in America. It’s a pure survivor’s joke. Black-ish is about the upper-middle-class black experience, but it refuses to oversimplify the place that oversimplifications have in our hearts. When Dre speaks with affection and no small pride about being the “big scary black guy,” or when he talks about black women’s butts and black guys’ dance skills, O.J.’s innocence and his Pop’s pretense that he was at the March on Washington, when he discusses fried chicken and basketball, it is simultaneously true that these things are hoary, trivial, and in some cases pernicious stereotypes—and also that they are signifiers of belonging. Whether you are black or Hispanic or Catholic or Jewish or Indian or Italian or a member of any other of Americans’ myriad ethnic groups, you know exactly the pride your cohort takes in the same sort of inessential, overly broad, and possibly even offensive generalizations—generalizations that only members of the group in question can make about themselves. These details don’t mean everything, but they don’t mean nothing, either. Our cultural identities are more than just a list of clichés, and yet those clichés still signify. What ultimately gives Black-ish so much warmth—a warmth reminiscent of, yes, The Cosby Show—is its optimism that audiences, of all colors, will not be turned off by its specificity. (This is, ironically, exactly what The Cosby Show was pessimistic about.) Black-ish is about the affluent black experience, no apologies, no soft-pedaling. And that experience, of course, encompasses the anxiety of raising your children, the sustaining of a great marriage, and the ongoing project of being the person you most want to be. Like the many, many sitcoms about the affluent white experience, this is a show that is meant to be seen and enjoyed by everyone.